The breading season is getting up to speed in Loro Parque Fundación. Most of the Loris, Psittacula, Brotogeris and Eclectus already have laid and the first eggs have hatched in some cases. Other species such as Cacatua, Amazona and Pyrrhura have start laying but haven’t yet reached the breading peak. Our visitors can observe the first chicks of this year in the Baby Station. Among others, of note are four young Blue-bellied parrots (Triclaria malachitacea) which we are being reared from the egg, a species traditionally difficult to hand-rear. We are also content with the beginning of the year for the Pesquet’s parrot (Psitrichas fulgidus), because we are rearing six chicks and another is being reared in the nest by its parents. 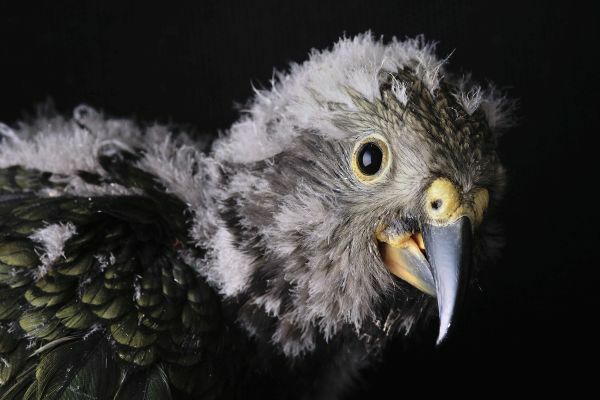 The chicks of the Kea Parrot (Nestor notabilis) pairs that had laid eggs in January are already in the Baby Station. There are four chicks in total, growing at break-neck speed. This species has a thick and long white down from hatching that protects the chicks from the low temperatures in the natural habitat. 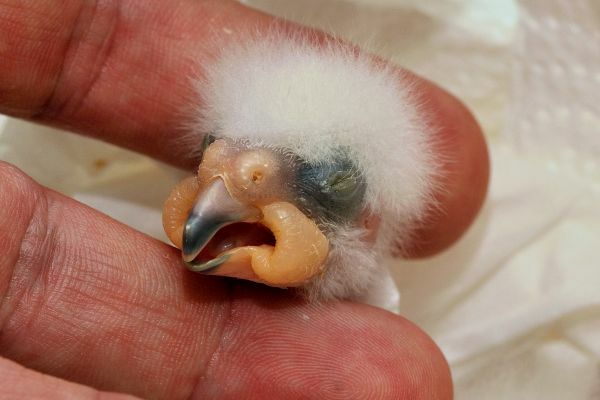 Due to this characteristic, during artificial rearing it’s necessary to keep the chicks at a lower temperature than any other parrot, otherwise they would stifle. Another striking characteristic of these chicks is the presence of bulky yellow fleshy parts on both corners of the beak. These fleshy parts are unique to this species and give them a distinctive appearance. The chicks hatch with them and they grow at the same time as the rest of the body, and do not disappear until they start feeding themselves. The function is unknown but I have a theory: the Kea’s long upper beak is an adaptation to unearth roots and tubers, but when they feed a young chick they cannot engage with it in the same way others parrots do. Last year we placed a video camera inside one of the Kea Parrot’s nests and could watch at first hand the complete natural breeding process. While the chicks were in the nest, they were fed exclusively by the female and she did it by placing the beak in a way that the upper part fits with the fleshy part of the chick. Apparently, this peculiar structure of the chicks may help to support the beak of the female, making feeding easer and protecting the chick’s head from her sharp beak. I had the opportunity at the end of the month to visit the Czech Republic to give a presentation at the annual National Convention of Aviculture. The convention was very interesting and involved more than 150 participants from seven countries. I was glad to see the number of young participants, which is something encouraging compared to other countries where the average age at these events is constantly increasing. I also had the opportunity to visit some private collections, all of them of high quality, as well as the Prague Zoo. I had been looking for the opportunity to get know the private parrot collections of this country for a long time, and thus I am very grateful for the invitation of the Czech Association of Exotic Bird Breeders (ACHEP), and to Lubomir Tomiska, Jan Sojka and Zdenek Vandelik for being my hosts, as well as to all breeders who opened the doors of their facilities so that I could visit them and we could share experiences.